Most Kiwi kids will be familiar with Little Baa Baa and Quirky Turkey, the characters in Mark and Rowan Sommerset’s award-winning picture book Baa Baa Smart Sheep. I had no idea they were planning a sequel, but when I saw I Love Lemonade in a bookshop last week I had to read it. When you end up getting dirty looks from other customers because you’re laughing out loud in the middle of the store, you know it’s a great book. 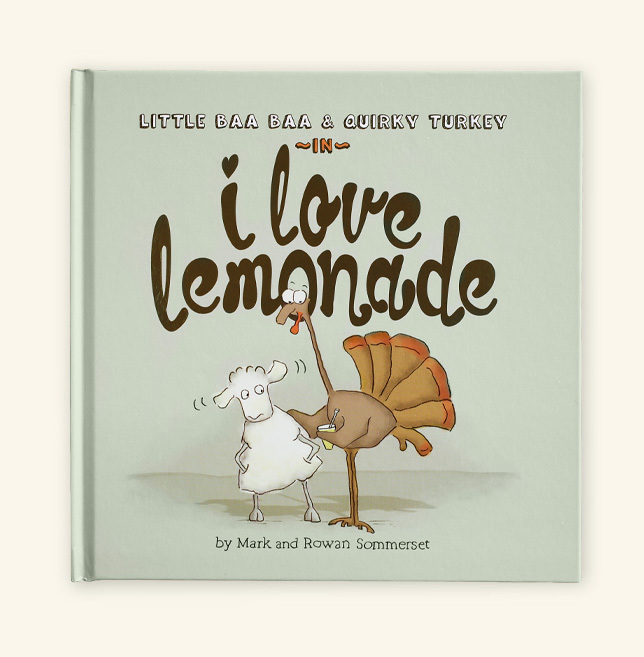 I Love Lemonade features the same characters as Baa Baa Smart Sheep, Little Baa Baa and Quirky Turkey. After being tricked into eating Little Baa Baa’s ‘smarty tablets,’ Quirky Turkey decides it’s payback time. But has Quirky got what it takes to pull the wool over Baa Baa’s eyes? I Love Lemonade is absolutely hilarious and is, I think, even better than Baa Baa Smart Sheep. It’s told in the same way as the first book, with Baa Baa and Quirky having a conversation with each other, using the back and forth speech bubbles. At first I thought it was just going to be a role reversal of the original story, but it is far better (and funnier) than that. Eating ‘smarty tablets’ definitely hasn’t made Quirky any smarter, but he’s out for revenge. I love a story with some good toilet humour and Mark and Rowan write these stories so well. I certainly don’t think I’ll look at lemonade the same way again (especially when it’s freshly squeezed!). If you’re cracking up laughing while you’re reading it (like I was) you know that kids are going to love it. Mark and Rowan are the perfect team and it’s the combination of their text and illustrations that make the book so funny. You could act out the story, just using Mark’s text and kids would be rolling around on the floor, but Rowan’s illustrations give the characters their personality. Their facial expressions tell you so much, especially Quirky Turkey’s expressions. At the beginning, you can tell by the look in his eyes that he thinks he has tricked Baa Baa, and you can see him getting more and more excited as the story progresses. If you want a picture book that will have you and your kids in stitches grab a copy of I Love Lemonade from your bookshop or library now. OOh! I would love to win hiss new book I love lemonade. This would be so much fun to read, I know Baa, Baa, Smart Sheep was so hilarious, this must be too. If I don’t win, I will be definately buying it for our library next year.